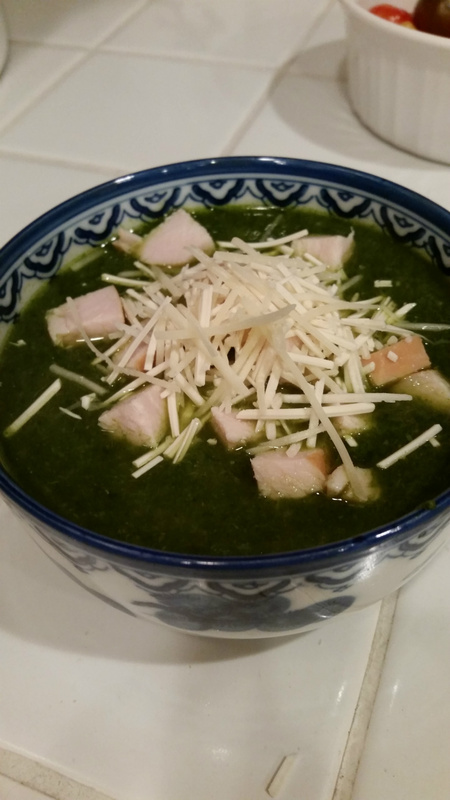 My version of Green Soup from Rocco Dispirito's The Negative Calorie Diet. If you didn't get a chance to make any of the smoothies in my post below, you really should give one a try. They are great for breakfast or any meal replacements, and with the fiber and greens and/or fruits such as strawberries, blueberries and kiwi, they are super for your brain as well! The Negative Calorie Diet, by Rocco Dispirito, has some supurb recipes for "real food" as well - diet or not. 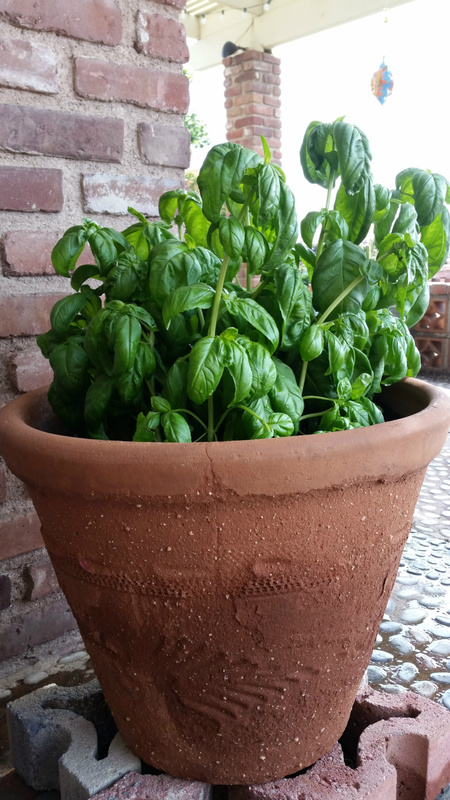 One such recipe is the "CaldoVerde" or Mixed Leafy Green Soup with Chickpeas. This soup reminds me of split pea, but using your choice of leafy greens. The chickpeas, or garbanzos are blended to add to the body of the soup, and I carmelized and pureed a sweet onion which added flavor, as well as a hint of red chili powder and green tabasco. 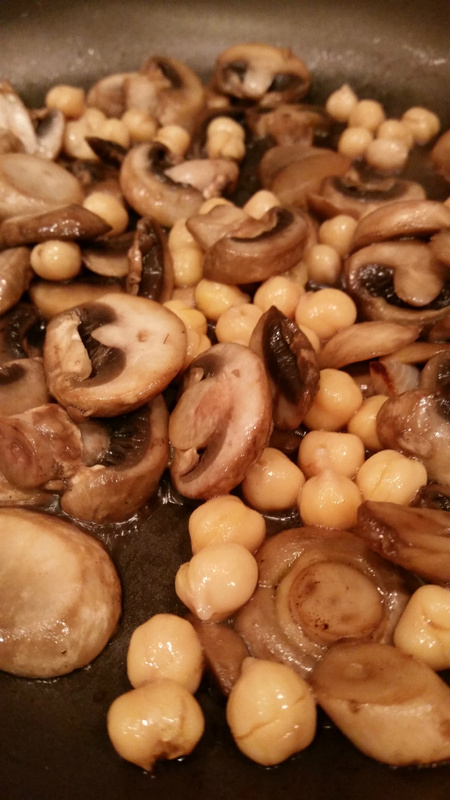 In a second batch I decided to saute mushrooms and a few whole garbanzos to give the soup a chunky texture. Apparently, Caldo Verde means "green broth" in Portuguese, and it is Portugal's unofficial national dish. You can think of it as a hot smoothie, and add chicken, turkey, ham, or clams for added protein. You can also use greens of your choice in this soup. 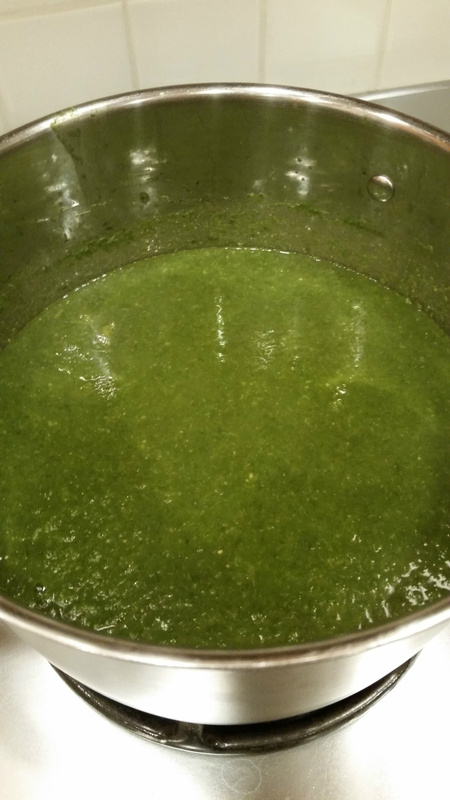 Kale, spinach, collards or mustard greens puree well. 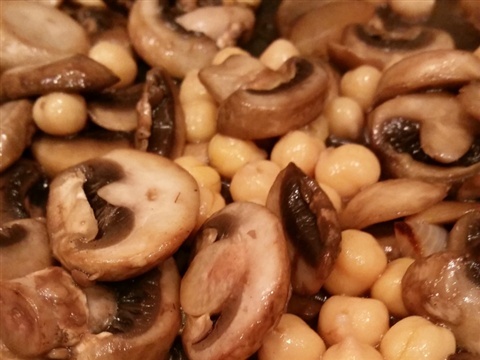 I added mushrooms to this recipe and loved the chunky result. Using the first 1 1/2 tablespoons of olive oil, chop the sweet onion and carmelize in a medium skillet with the garlic, and pour into blender or food processor. In the same skillet using the rest of the olive oil, sauté the sliced mushrooms and 1/4 of the can of garbanzos without the juice. Pour into a medium soup pot. 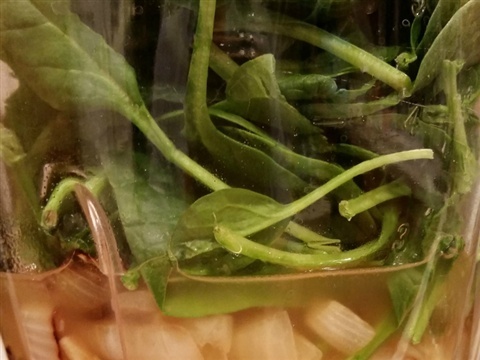 You can make this soup in the blender or food processor. 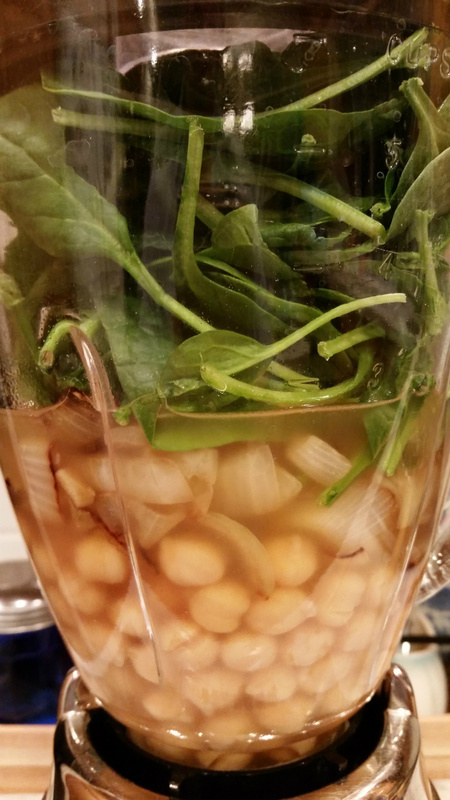 Add the rest of the garbanzos and a cup of the greens at a time, intermixing with cups of the chicken broth, in the blender and blend until all of the greens are gone. Pour the remaining broth in the soup pot with the mushrooms, as well as the puree from the blender. Add the tabasco, chili, powder, and a teaspoon of salt and pepper to the pot and mix. Bring the mixture to a boil and lower heat to simmer for 15 minutes. 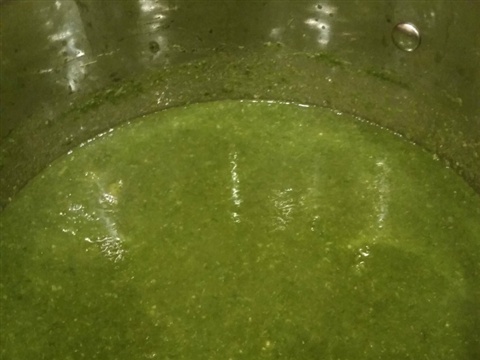 This was the first pot of green soup I made without the mushrooms to add to the texture. This soup can be kept in the fridge for several days and freezes well. A little cheese, croutons, or meat added upon serving will make it more hearty but it is really delicious on its own! 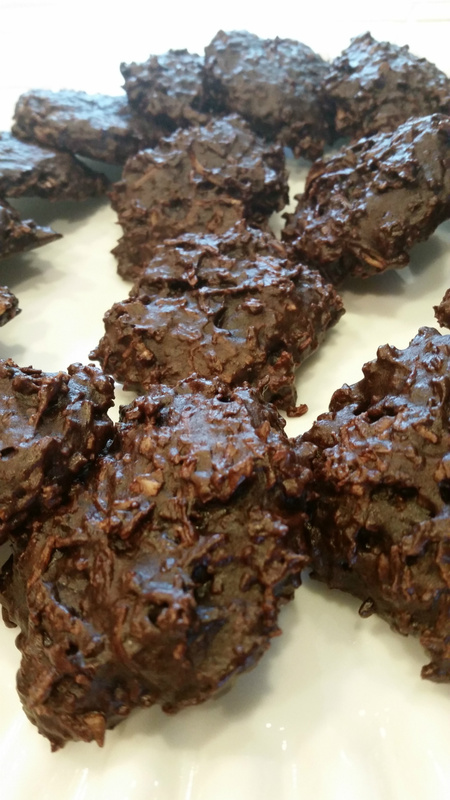 So chocolatey, full of chewy coconut and only 2 Weight Watchers points. Oh... and they are vegan! Many dieters go cold- turkey off of processed sugars. They want to detox and cleanse, and therefore they do not eat anything containing sugars that are not naturally found in foods like fruits. Others may include small amounts of sugars or sugar substitutes in their diet. For example, on Weight Watchers, all foods and ingredients are given points, and although you are encouraged to eat healthy foods, you can monitor your sugar intake and enjoy a certain amount of sweet snacks and stay on your diet. 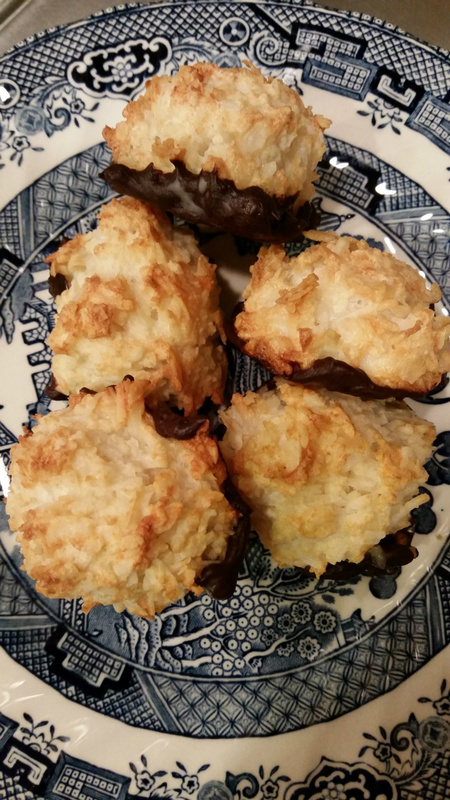 These chewy, chocolately wonders are full of delicious coconut, are vegan, and count for 2 or 3 points on Weight Watchers. If you can keep yourself from eating more than two, they will fit into a weight-loss program while helping you feel like you are not punishing yourself! 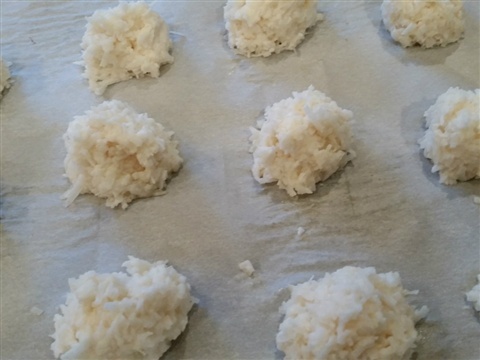 1 cup dried shredded, unsweetened coconut * I had to add another 1/2 cup of coconut to make the dough stiff enough to scoop out onto the cookie sheet. Preheat oven to 350 degrees F. Line two cookie sheets with parchment paper. In a large bowl, mix together flour, cocoa, baking soda and salt. 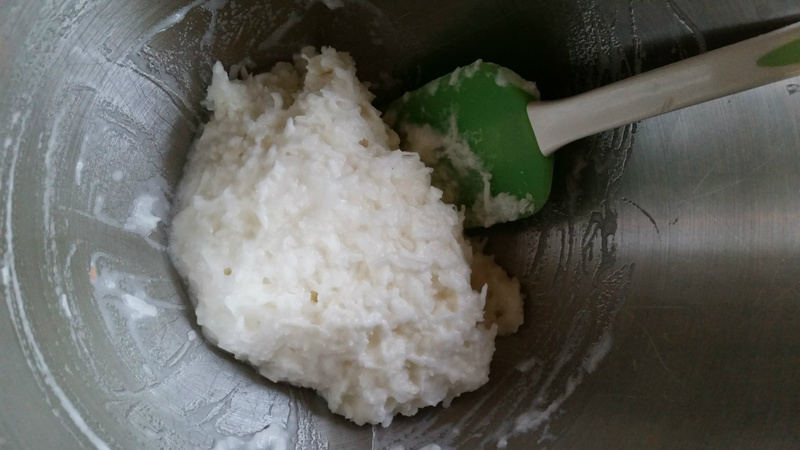 In another large bowl, using an electric mixer, beat sugar with oil and vanilla until well-blended. Add half of flour mixture and half of water to sugar mixture and beat until smooth. 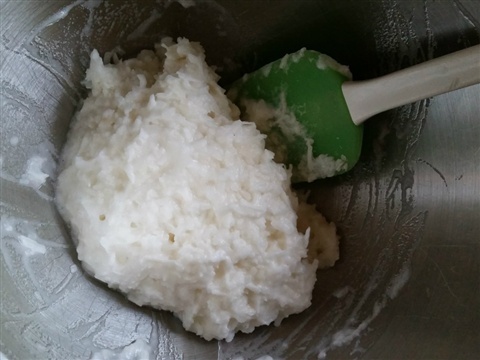 Add coconut, remaining water and remaining flour mixture and beat until well-combined. Dough will be a little stiff and sticky. Scoop tablespoons of dough onto parchment-lined cookie sheets and pat down to make flat cookies. Bake until done, about 8-10 minutes. Allow cookies to cool on cookie sheets for about 2 minutes and then remove to a wire rack to cool completely. You've gotta have some snacks! I forgot you can make popcorn in the microwave without all the chemicals!! I never really liked microwave popcorn. I hate that yucky taste it leaves behind in your mouth after you eat it. I could take a look at a package and marvel at the additives that apparently it takes to do something as easy as pop corn, but I won't. I have an air popper, but I don't really like the texture of the corn. 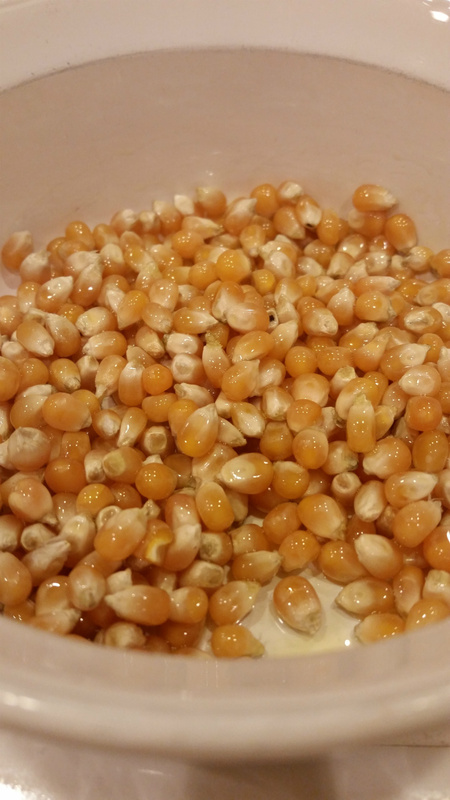 My husband is a king at popping corn on the stovetop using oil and his special shake popper, and it tastes wonderful, but it takes a lot of effort. 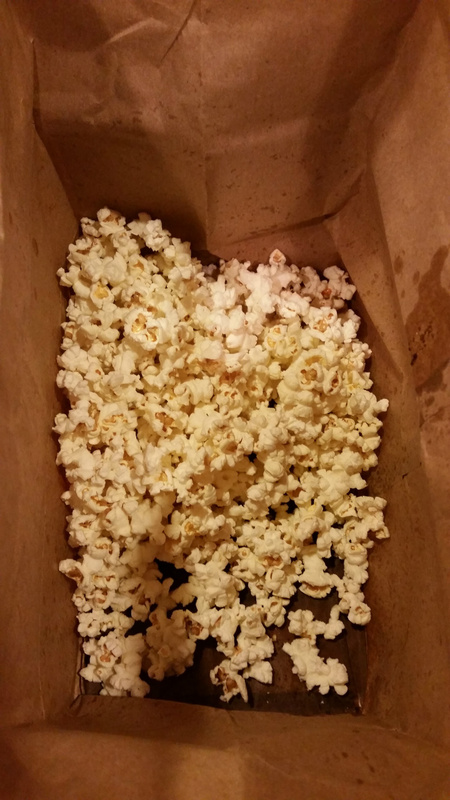 When I saw this recipe on Facebook, I remembered that at one time I used to pop corn without all the packaging. My mother-in-law has a special microwave container that is especially made for popping corn. This recipe uses a paper bag. It doesn't get more basic than that! 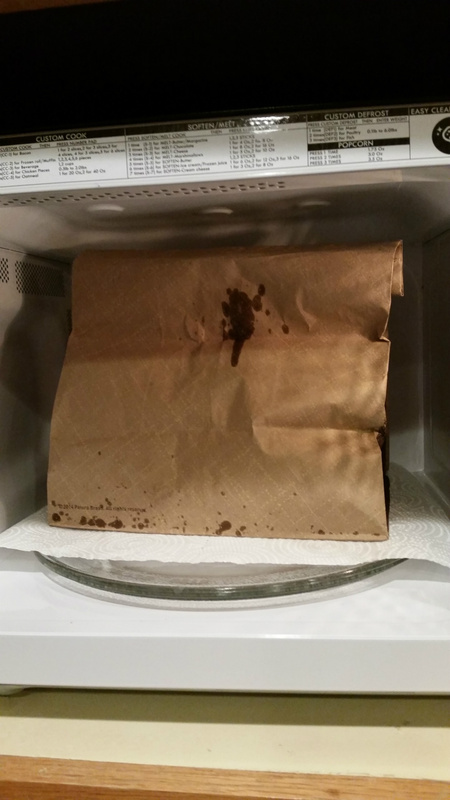 The corn popped in a bit of oil in a paper bag in the microwave is light and crunchy. It is so easy to do, and actually tastes good with just a little salt if you don't want to butter it up. 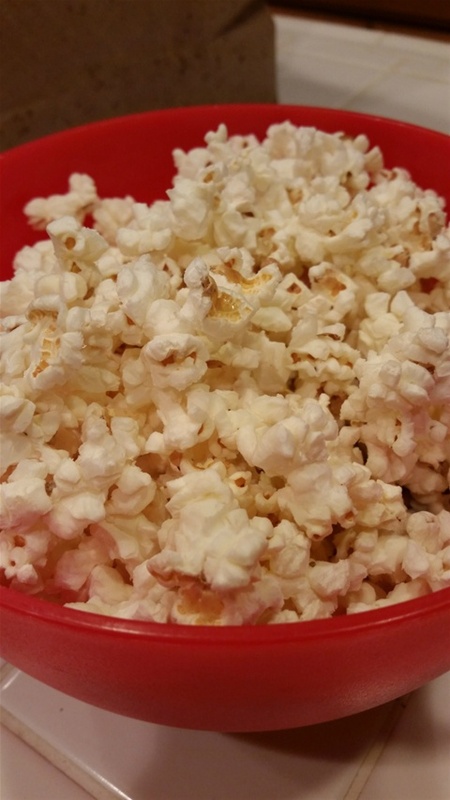 Directions: In a bowl mix 1/3 cup popcorn and 1 tsp olive oil. 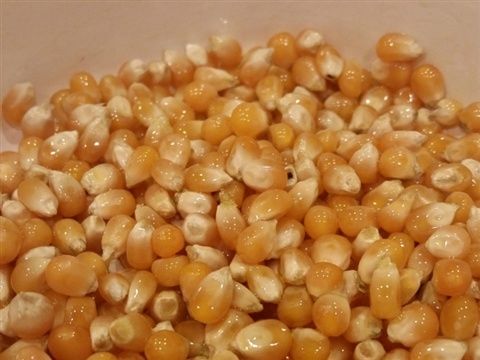 Mix with a spoon to cover the kernels. 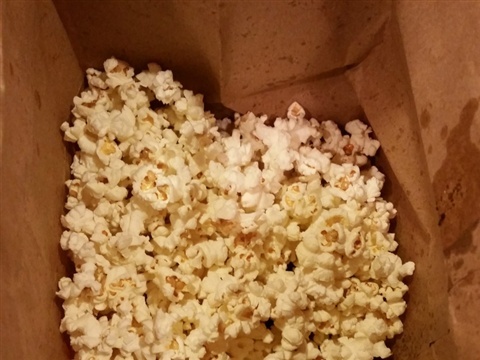 Pour the popcorn into a paper bag and place on a paper towel in the microwave. Fold over the top of the paper bag at least two times. 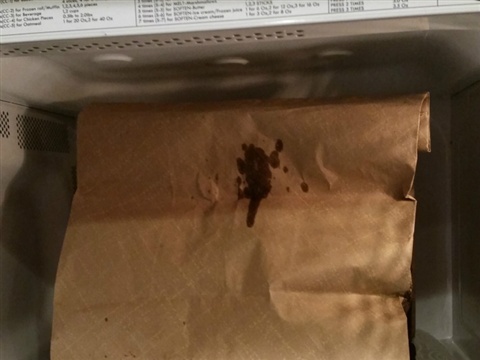 Cook in the microwave for 2-2 1/2 minutes or until the popping gets down to every 2 or three seconds. Watch the popping process closely to prevent burning. Remove from microwave and season to taste. 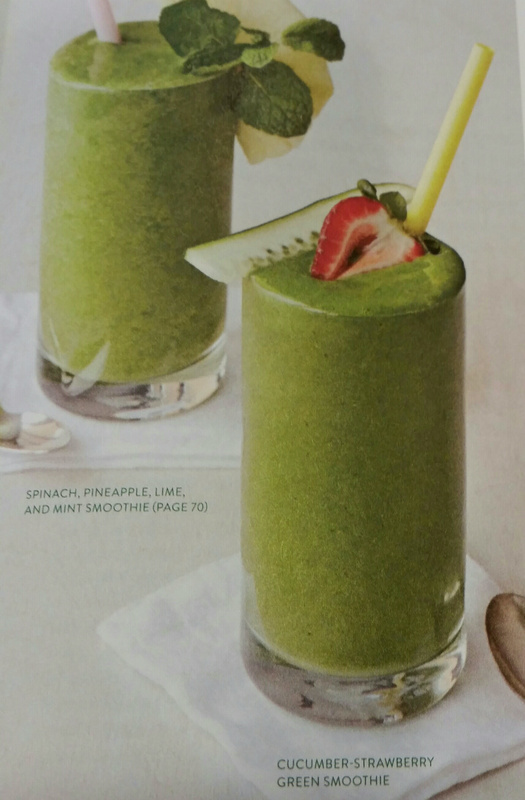 Here is Rocco with one of the smoothies in his book. Yes, I did give him horns and a goatee because I was mad at him and a little hungry on day 2 of the cleanse. Before I begin, let me just officially say "Blah, blah, blah, blah" to my previous blog entry about trying the Paleo Diet and incorporating details from Weight Watchers to lose some extra pounds. Didn't work so well. For me, I think I need something that is pretty strict to start and will give me a good kick-off so that I will want to continue. I'm talking real pounds off and staying off. I'm talking a big change. I have purchased four "diet" books in the last couple of weeks. I saw three of them on daytime tv shows, and one I kept getting posts about on Facebook. Of the four, I am most impressed with the online "FitGirlsGuide" and The Negative Calorie Diet by Rocco Dispirito. Both programs give you complete menus, if you like, and are focused on making positive changes in your eating habits and life. I must say though, FitGirlsGuide is hilarious to read, and has crazy vintage pictures featuring girls and cute little pets that just make you smile. It also includes a 30 minute a day exercise regime. Rocco - not so much. 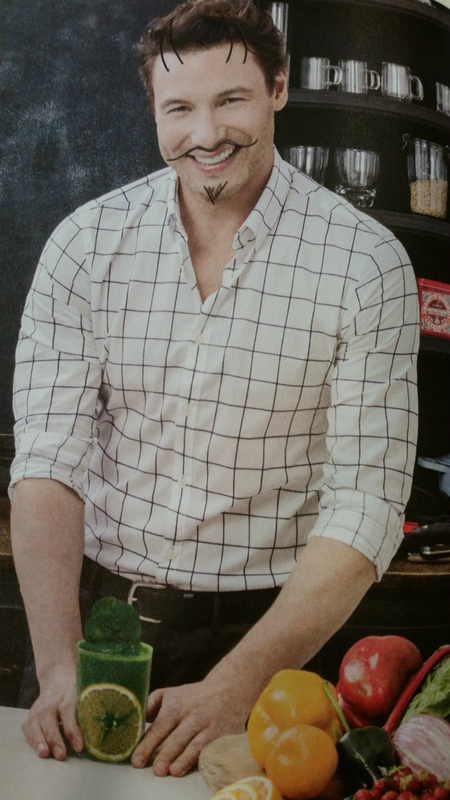 He is a James Beard Award-winning celebrity chef and the author of 11 books, three which are #1 New York Times bestsellers, including The Pound a Day Diet. He is a chef, and has done research on foods that cause the body to burn fat and lose weight. In The Negative Calorie Diet, he offers up a list of these foods, a 10 day smoothie, salad and soup regime to cleanse your system and kick-start your weight loss, followed by a 20 day "clean-foods" menu to continue the process. All I can say at this point is... I lost four pounds in two days and it wasn't horrible. The smoothies are good, and you get to eat lots of fruits and veggies. I am currently on Day 5 of the 10 day cleanse and am holding steady at 4 pounds down. I have been weighing every-other-day just because I'm really curious, and am really hoping for another pound down tomorrow. Of course if you want to try this you really should buy the book, but I'm going to share some of the basics with you as well as several of the recipes on the eating plan. Even if I was not doing the diet or cleanse, I would use the smoothies for breakfast. One of the things I have noticed about the smoothies, as opposed to others I have made or read about, is that all of them include protein powder and fiber. I don't usually frequent health food stores or GNC, so I picked-up a containter of whole psyllium husks from Trader Joes. Rocco advocates for using all organic and natural ingredients, but when the recipes ask for monk fruit extract as a sweetener I have been using Truvia. Something funny - I've been using left over chocolate protein powder because I had it in the pantry and didn't want it to go to waste, so the smoothies look pretty aweful, especially when they include greens. That's why I'm using pictures from the book, because mine currently don't look like anything you would want to drink! Following you will find three smoothie recipes that I like the best. Not suprisingly, they are all sweet. There are savory ones in the book which I will include later. Give one of these a try for breakfast and I guarantee that you will feel full and satisfied. 1. Put the water, sweetener, almonds, and fiber in a blender and blend until smooth. 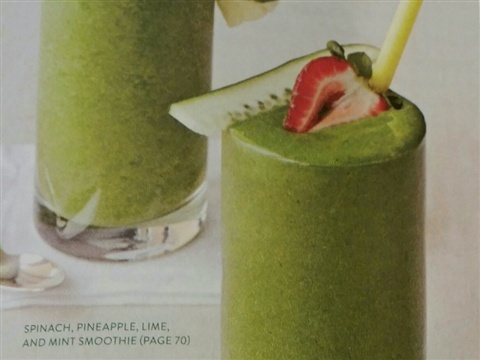 Add the kale, cucumbers, strawberries, and banana and blend until smooth. 2. Add the protein powder and the ice and continue to blend until smooth. Serve immediately. 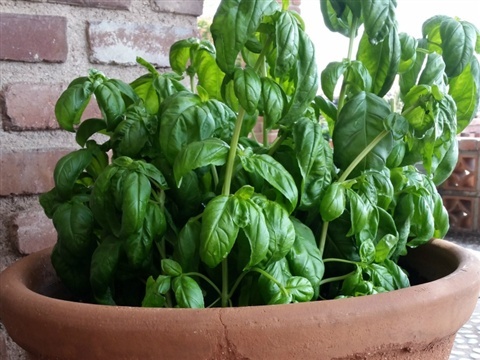 I used my newly-planted basil to make Rocco's Blueberry-Basil Smoothie. It is my favorite so far! 1. Put the almond milk, fiber, blueberries, vanilla extract, sweetener, and basil in a blender and blend until smooth. 2. Add the protein powder and the ice and blend until smooth. Serve immediately. 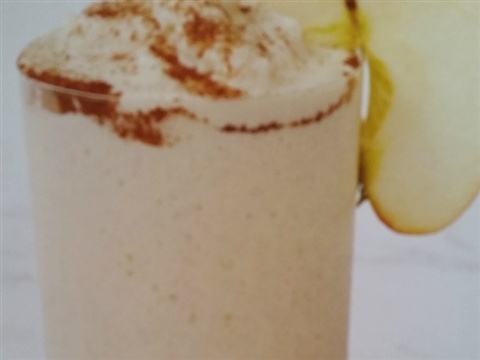 This smoothie really does taste like apple pie! Plus it has a whole apple in it for great fiber. 1. 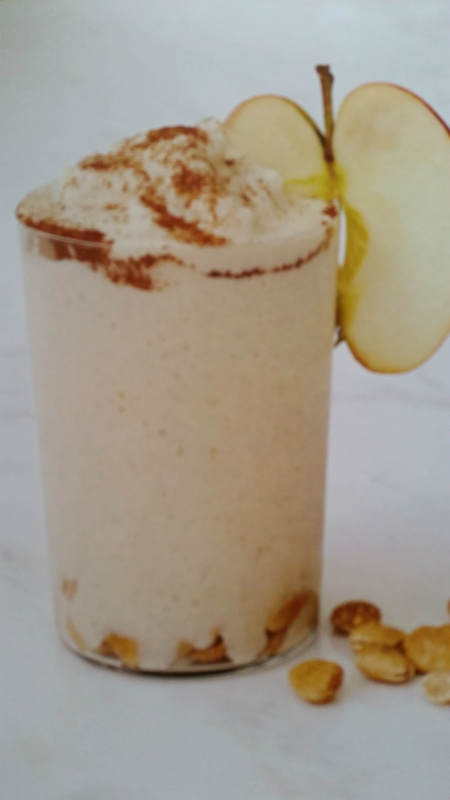 Put the almond milk, fiber, apple, vanilla, sweetener and cinnamon in a blender and blend until smooth. 2. Add the protein powder and ice, and blend until smooth. Serve immediately. I suppose it had to happen. Tradition has to be dragged into 2015 - kicking and screaming if necessary. You can only hear how bad sugar and flour are for you so many times and ignore it. You turn 56 and realize that it doesn't matter if you work out seven days a week. You see Suzanne Somers on tv and she says that everything you like eating is toxic. You want to be skinny... well skinny-ish anyway. And of course, healthy. It's called compromise. Luckily, I have had personal and positive experiences with three different diet plans so when my husband's doctor recommended the Paleo Diet and I looked it over, many things about it seemed familiar and doable. I have lost 30 plus pounds three times in my adult life. Once using LA Weightloss, once with WeightWatchers online, and once doing the Atkins Diet on my own. I love losing weight! It gives me such a feeling of accomplishment. I loved how I looked in clothes. I loved the compliments. It just gets so darned hard the older I get. I don't eat a lot but I do like to cook. I love baking bread and cookies and cakes, especially for special occasions, and I have been known to frequent Starbucks and order mochas. I am fully aware of what I need to change in order to lose weight. It looks like this time I will be doing it while using the Paleo Diet as a guide. After a cursory look at the recipes in Paleo for Beginners, it became obvious to me that the Paleo plan and the Atkins diet were very similar with a few key differences. Both do not contain sugar or carbs in the form of baked goods or pasta. Actually, you can eat limited whole grain items later in the Atkins diet and the Paleo has you use glutin-free foods or foods made with coconut or almond flour if you are going to eat any baked goods. The Paleo diet does include fruit, which is generally not allowed in the Atkins until you have been on it for awhild. Neither diet includes legumes. The Paleo does not include high-salt meats like deli meats or bacon. The Atkins plan does not recommend deli-meat but does include bacon. In both eggs and various nuts are included. And finally, cheese and cream are allowed in the Atkins and no dairy in the Paleo, even though I have decided to use unsweetened almond milk in coffee and cooking. 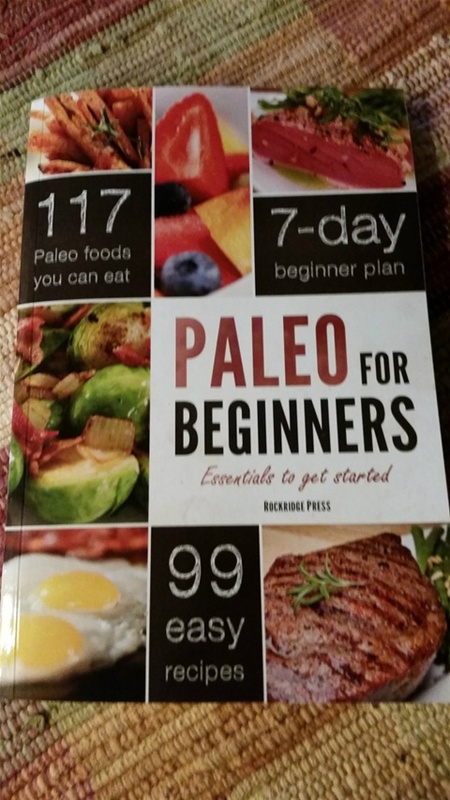 The Paleo for Beginners book contains 99 easy recipes. I was really excited to see a Paleo chocolate chip cookie. Forget the main dishes or delicious vegetable side dishes... THEY HAVE COOKIES!! My bubble was burst a bit when I mentioned this with enthusiasm to my daughter on the phone and she said, "Mommy, you are not going to lose weight by eating chocolate chip cookies." After thinking up a snarky retort like, "Go eat some quinoa," I thought about her comment and had to admit that she was right. I always try to find the cheats on a diet, like eating Chicharrones when I was on the Atkins because they were like chips, salty, and had no carbohydrates. I know I will do the same thing this time but I have promised myself that it will be in moderation. My plan is to adhere to a low-carb plan using what I know about the Adkins diet and incorporating recipes from the Paleo diet. I'm not going to include fruit until I lose at least 10 pounds, but I am going to use cheese as a protein source. No yogurt though. I will eat various meats and include carbs in the form of green veggies. I will not eat wheat or baked goods or pasta unless I have made something for a special occasion and hopefully have modified it using almond or coconut flour. I will be using artificial sweeteners such as Splenda. You can substitute it cup for cup instead of sugar in baking. I will also use unsweetened almond milk and stay away from soy products. I will allow myself one diet soda per day and will not drink wine. I might have a Bud Light with Lime once a week and make myself an iced-coffee using unsweetened almond milk and sugar-free creamer. My goal is 20 pounds at about 2 pounds per week. I will weigh myself once a week and exercise however and whenever I feel like it. For me, it is about what I eat and not how hard I exercise. I'm on day 5 as I write this post, and will be weighing myself every Monday morning. I'll keep you posted. My new mission: turn those traditional recipes that I know and love into Paleo ones using new ingredients. I recently read that if you really love your friends and family you won't serve them sugary cakes, cookies, etc. I've been thinking about that. I think one can exhibit self control when eating special desserts. I think that I can try to use ingredients that are healthier when baking. I also went out and invested in mini-sized glass dessert cups. I can have my cake and eat it too! 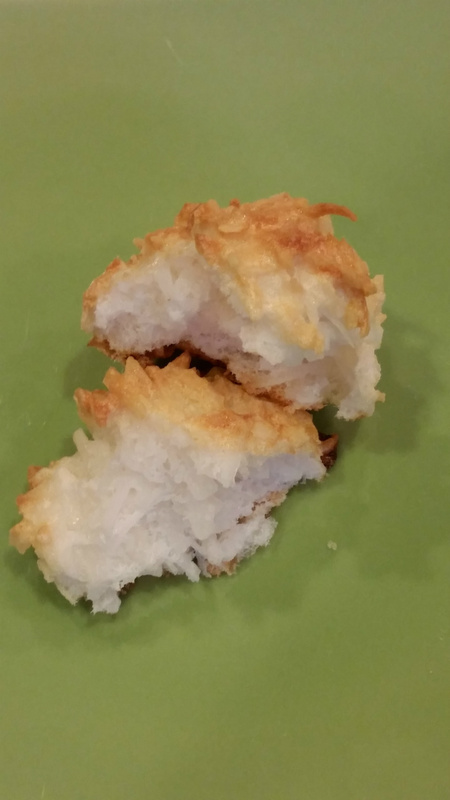 Along that vein, here is a recipe for 3 ingredient coconut macaroons that I found on Pinterest. 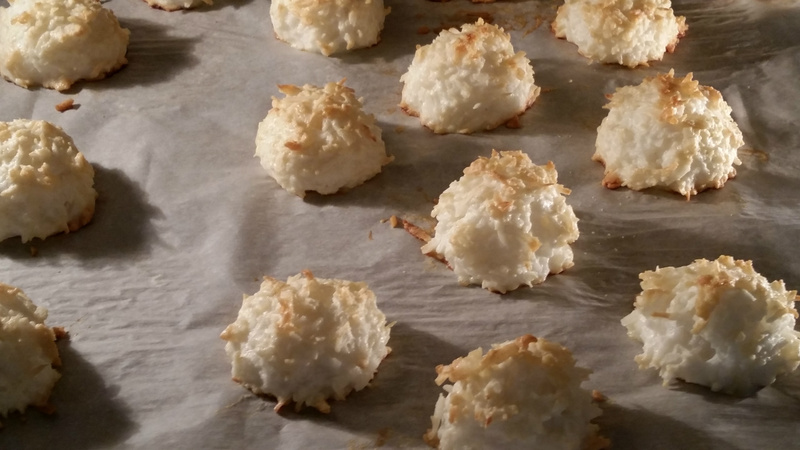 Most of the macaroon recipes included flour or sweetened condensed milk. This one did not, and I substituted Splenda for the sugar. They turned out scrumptious! Crisp on the outside and goey on the inside. Realistically, on a diet I should only have one or two of these not more than once a week. 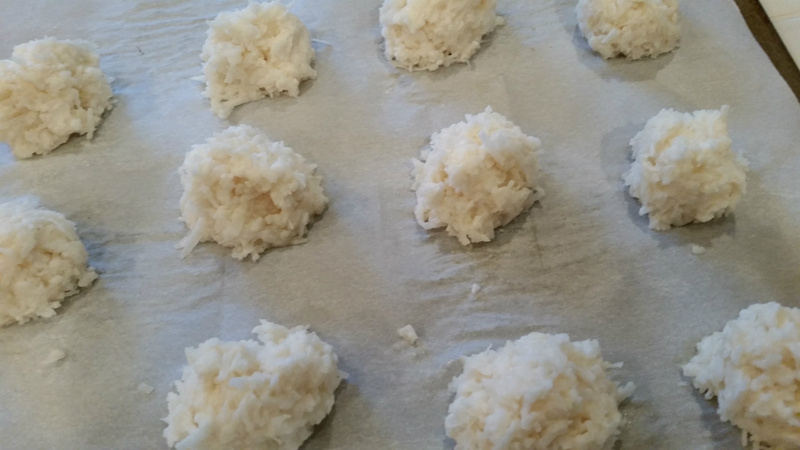 The unsweetened coconut has 7 carbs per quarter cup, so one cookie probably has 3 carbs or so. I did, however, decide to dip the bottom of each cookie in chocolate. I'M SORRY. I couldn't help myself. I did use 60% cacao chips with a splash of unsweetened almond milk. 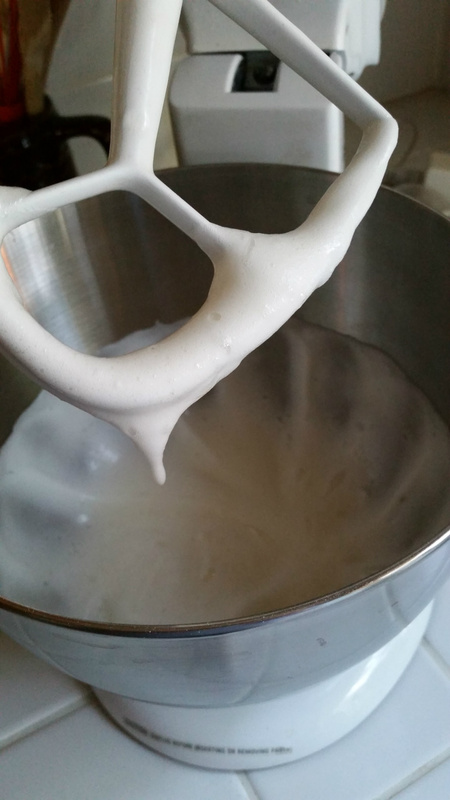 Egg whites and sugar are mixed. Preheat oven to 325F and line baking sheet with parchment. 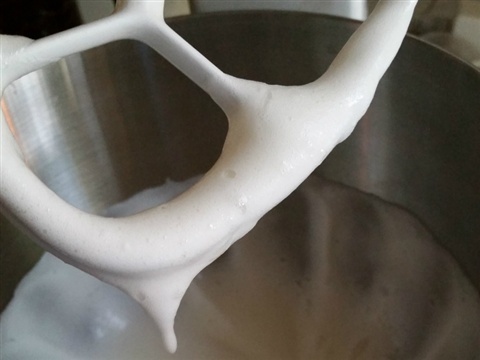 In a mixing bowl, beat the egg whites and sugar until foamy. Add the shredded coconut and stir gently with a spatula. 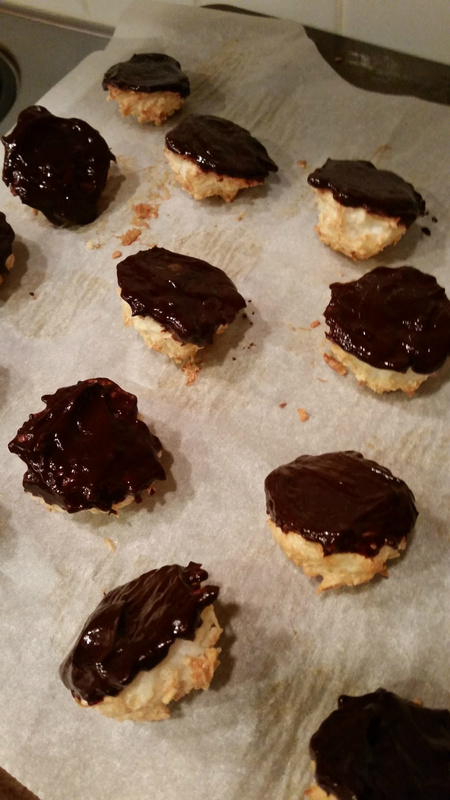 Transfer to a piping bag or use spoon to drop macaroons on the parchment. Bake for 20-25 minutes or until golden and set. Cool for about 10 minutes before serving. Keep in an airtight container for up to 4 days. Dipped in chocolate and drying. I can eat a couple of these and not feel too guilty.